SIGGRAPH 2018 kicked off yesterday. This five day computer graphics conference is being hosted in Vancouver Canada and runs from 12th - 16th August. AMD has a presence at SIGGRAPH 2018 (Booth #1101) and used the show to announce a new professional workstation graphics card, the AMD Radeon Pro WX 8200. This Vega-based card is available to pre-order today at Newegg for US$999, with on-shelf availability estimated for mid-September. You can find out more about the specs of the WX 8200 on the official product page, linked in the intro, and via a downloadable PDF data sheet. The key features of this professional graphics card are outlined in the graphic below. The 56CUs provide 3584 GCN Stream Processors and these are supported by 8GB of HBM2 on a 2048-bit interface delivering 512GB/s of bandwidth. AMD's 14nm 250W double slot 10.5-inch card comes with 4x mini-DP(1.4) connectors. Performance indicators are; 21.5 TFLOPs FP16, 10.75 TFLOPs FP32, and 672 GFLOPs FP64. 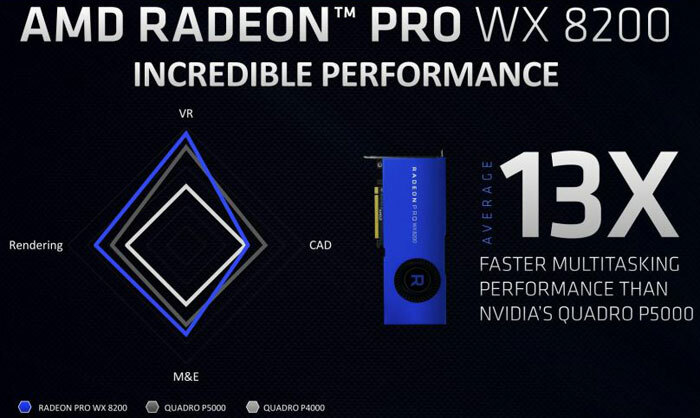 If you head on over to the press release about this new professional graphics card you will find some interesting details in the footnotes comparing the new AMD Radeon Pro WX 8200 ($999), with the Nvidia Quadro P4000 (850), and Quadro P5000 ($1,885). AMD ran tests in VRMark, Cyan Room, Adobe Premiere Pro, Autodesk Maya 2017, Blender, and more to show how well its new sub-$1,000 solution compares. 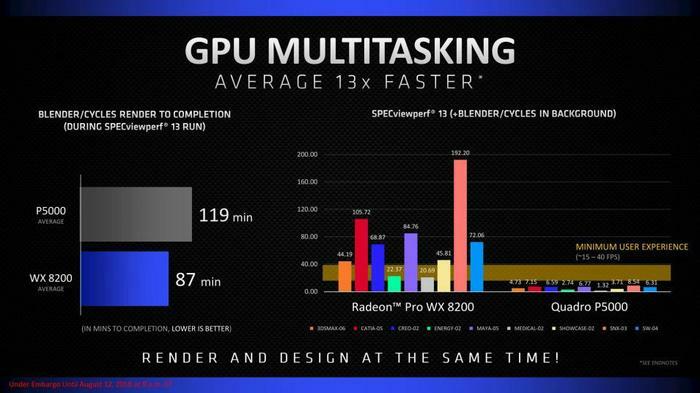 Rather than list all the numbers and comparisons in the footnotes, it is much easier to check out graphs and charts and it is good to see AnandTech shared AMD's presentation slides from SIGGRAPH. Above you can see an overview of how well the WX 8200 competes in Rendering, VR, CAD, and Media & Entertainment. One aspect of the WX 8200 that is more convoluted to show in charts is its purported excellent handling of mixed workloads with multitasking. Nevertheless AMD has tried to show this attractive usability feature in the slide below. At its SIGGRAPH booth, AMD is also highlighting the new 2nd gen AMD Ryzen Threadripper desktop processors, designed for professional content creators, developers, gamers and hardware enthusiasts. Demonstration at the AMD stand include; AI Rendering, Real-time Viewpoirt Raytracing, Cloud ProRender, and PIX performance turning for DirectX 12 games. Nvidia will be showcasing various graphics technologies at SIGGRAPH 2018. CEO Jensen Huang will take to the stage today at 4pm PT to talk about AI, real-time ray tracing and VR. Talks and tutorials covering Nvidia tech will take place on Tuesday, Wednesday and Thursday. 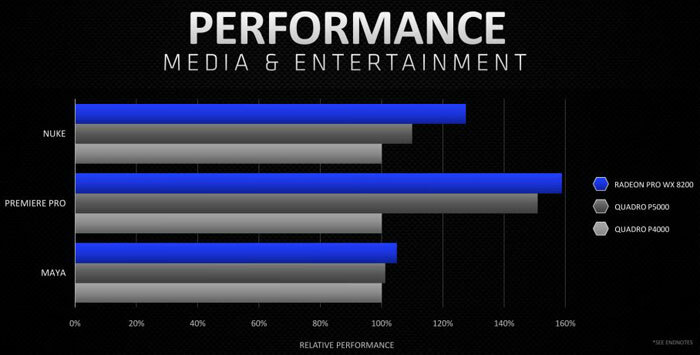 weird that AMD is the only tech company that compares its GPU/CPU to the competition, I have not seen Nvidia do this! Until recently, have Nvidia ever needed to? 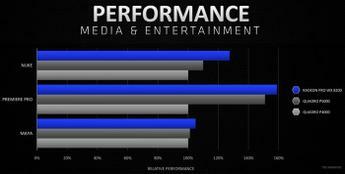 Nvidia only compares to itself, and pretends there is no competition. It works well for them, especially since a lot of their customers are trapped in CUDA dependency. Yes, AMD has CUDA support and porting tooling, but many businesses just want to have an abusive supplier dependency. I do wonder with Hynix now coming online whether costs of HBM2 should start to drop?? Hmmm Hynix HBM2 at 2.4 GHz now available. That would be perfect for a 12nm die shrunk Vega. It always seemed to me that Vega was memory bandwidth constrained.